History : 1986 : Acquired base system with 64K memory upgrade. 06/23/1998 : Acquired second system for $3.99. 07/26/1999 : Acquired system with 2 joysticks, power supply & frogger cart for $9.99. 08/05/2001 : Was given 2 more systems and a 410 recorder. I picked this up from a friend I use to work with. 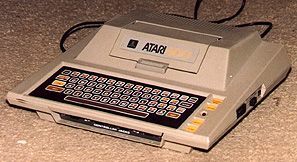 He ran a company I wrote some Atari games for and he had this system after he got out of the business. I picked it up and added it to my collection. The original 16 K ram had been upgraded to 64 K. Check out my Atari Library.